Ceramics are objects made from shaping clay and other raw materials through the process of pottery. The word "ceramic" comes from the Greek "keramos" meaning "clay." Ceramic objects have been made by human cultures throughout the world for almost 5,000 years. Traditionally, ceramic objects have been made for both artistic and utilitarian purposes. Today, ceramic as an artistic form of expression thrives alongside its importance in various technical industries. The earliest ceramic objects are to be found in Mesopotamia, where the potter's wheel was invented in the 4th millennium BC. This quickly spread throughout Europe, Asia and Africa, but it did not reach the New World until the European arrival. Early ceramic vessels were made by the coiling method of winding a long string of clay around the wheel and molding it to form a shape. 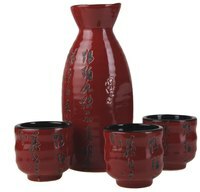 In ancient times, ceramic vessels were used for eating and drinking as well as storing substances such as wine. While early ceramic vessels certainly had a degree of artistry, it was not until some time later that humans used ceramic for strictly artistic purposes. The earliest known examples of this are the decorative glazed bricks from the Elamite temple at Chogba Zanbil in Iran, which date to the 13th century BC. Other famous examples of ceramics used in architecture include the Ishtar Gate of Babylon (ca. 6th century BC) and the Porcelain Tower of Nanjing (ca. 15th century AD). Ceramics are absolutely essential in the related fields of archaeology and anthropology. Archaeologists will often date and identify human civilizations based on the style and quality of the ceramic pottery it produced. Ceramic styles often give us clues about the culture from which it was produced. For example, archaeologists typically have classified Minoan ceramic from the island of Crete into four distinct periods with several sub-groups within each period -- the late period Minoan "marine-style" pottery frequently features motifs of sea creatures and dolphins, which suggests that the Minoans had developed a strong maritime culture at this time. Today, ceramics are still prized for their traditional artistic and utilitarian value. However, there are many innovative modern-day ceramic applications, with more being developed every day. For instance, ceramics are used in the auto industry (ceramic brake discs are more resistant to abrasion at high temperatures), in gas turbines and weapons engineering. A relatively new field, dubbed "bioceramics," has sprung up in the past few years, which focuses on creating ceramic replacements for body parts, including dental implants and synthetic bones. "The Big Book of Ceramics: A Guide to the History, Materials, Equipment and Techniques of Hand-Building, Throwing, Molding, Kiln-Firing and Glazing Pottery and Other Ceramic Objects": Joaquim Chavarria, 1994.